The Ice Bar at the Hotel C in Stockholm, Sweden is a great place to take a photo of your Baltic cruise vacation and have a drink to celebrate the beginning or end of a memorable visit to Stockholm. With a maximum of 45 guests, the Ice Bar is small, but wonderful fun. The Ice Bar has an interesting variety of drinks--all made with Vodka, of course! (Visitors who do not drink alcohol can get juice or other non-alcoholic drinks.) The IceBar Stockholm by IceHotel (the official name of the Ice Bar) is located in the Hotel C, just a few blocks from the Central Train Station and the Stockholm City Hall. You don't have to worry about the Ice Bar melting in the warm summer days of Stockholm. The interior of the Ice Bar is kept at a crisp 23 degrees Fahrenheit temperature (-5°C) all year round. All of the interior components of the Ice Bar, including the spectacular glasses, are made of pure, clear ice from the Torne River in northern Sweden. The Stockholm ice bar is open all year round. Reservations are highly recommended and can be booked online. The opening times are subject to change, so you might want to check at the hotel. The bar has a capacity of 45 persons and is open to all over 18. The reservations are given at 45-minute intervals, although most people only stay less than 30 minutes. The price at the Ice Bar includes warm clothing, a choice of drink in an ice glass, and of course the "​Ice Experience". The Ice Bar is located just off the lobby of the Hotel C in Stockholm. When you arrive, you pay the cover charge, and an Ice Bar employee will help you don one of the marvelous silver capes. The capes are designed to keep your body heat inside so it will keep you warm and keep the Ice Bar from melting! The shimmery silver capes are topped with a fake fur-trimmed hood, and mittens are provided. After getting prepared for the 23 -degree cold, you step into an airlock and close the door behind you. Next, you open the door and walk into the Ice Bar. Wow! The walls, tables, bar, decorations, and glasses are all made from pristine clear river ice. When you enter the bar, you will see other "silver-backed vodka drinkers", most of whom are armed with a camera. There is a lot of laughing and flashing (cameras) in the Ice Bar. Although the Ice Bar has small tables, there are for standing only, since there are no bar stools or chairs. I guess they either didn't want to have to pry customers from their frozen seats, or didn't want anyone to melt the stools! After removing your mittens to snap a few pictures, you will want to order a drink. Drinking from the ice glasses at the Ice Bar means that all drinks are "in the rocks" rather than "on the rocks". Note that these glasses are not dishwasher safe! The first Ice Bar was at the Icehotel in northern Sweden, which was first built in the autumn of 1989. Each year the Icehotel melts, and a new (bigger and better) one is constructed in the fall. Several years ago, the developer of the Icehotel had an idea of opening a permanent, year-round ice bar in Stockholm. In June 2002 the world's first permanent Ice Bar opened in Stockholm at the Nordic C Hotel. The timing was planned to coincide with the 750th-anniversary celebration of the founding of Stockholm. Today, many cities around the world and even some Norwegian Cruise Line cruise ships have an Ice Bar. 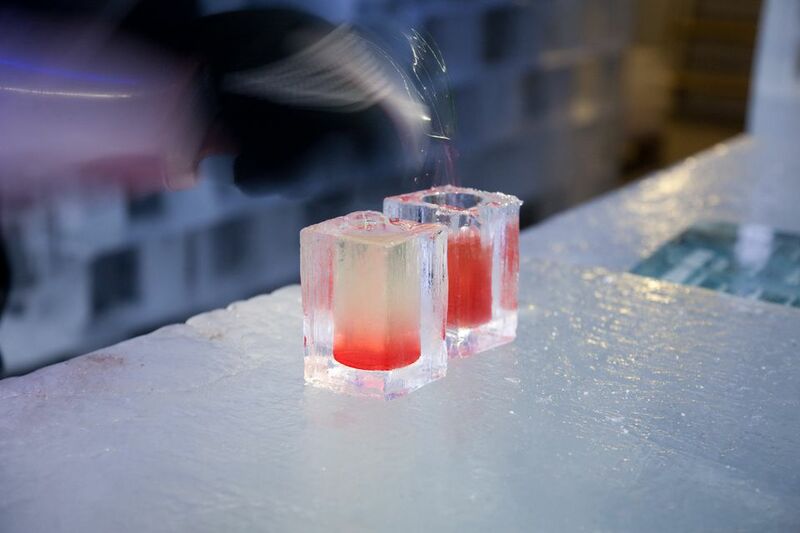 The first year, 70000 customers visited the Ice Bar and since then it has continued to grow in popularity. There is a London Ice bar near the Picadilly Circus and Oxford Circus tube stations, and several others around the world. The cold air of the Ice Bar could certainly cool down an overheated businessman or tourist in any city. The concept for the ice glasses was developed at the Ice Hotel in northern Sweden in 1995. The first ice glasses were cut by hand from river ice blocks taken from the pristine, crystal-clear Torne River of northern Sweden. Soon the ice glasses were so popular that a factory and production line was set up to manufacture the frozen glasses. Over 1 million glasses curved from the clear, pure river ice are used at the Ice Bars and Ice Hotel each year.